Paste the following in a terminal prompt. The script explains what it will do and then pauses before it does it. This package manager would be of great use throughout the installation tasks. We will need to edit the OpenCV installation file a bit. Install snappy, leveldb, gflags, glog, szip, lmdb and opencv. Install boost libraries for python. Keep track of all the path variables set in the the Makefile.config (the smallest of mistakes can lead you off track for days together). 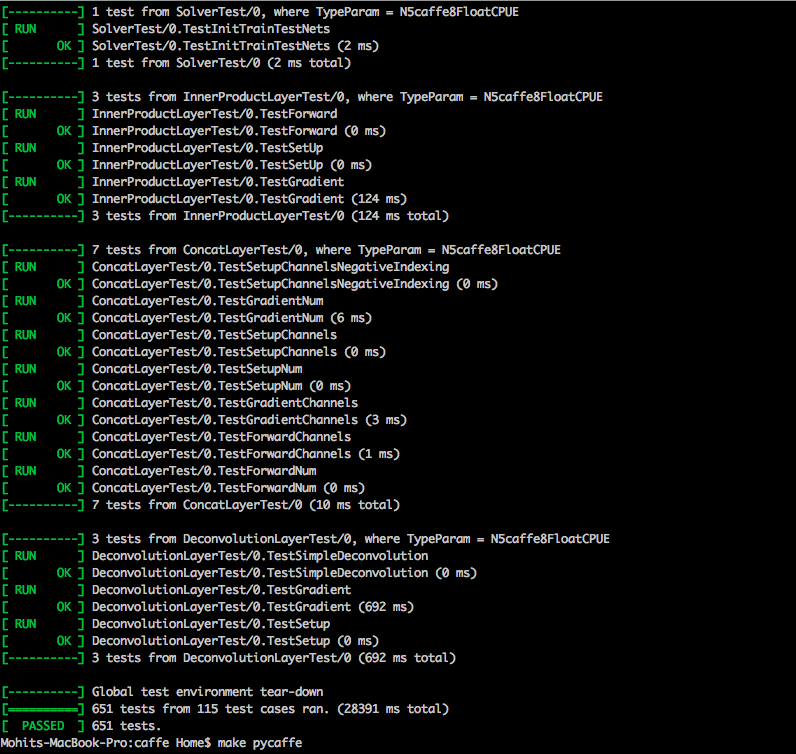 Here's my complete Makefile.config for the hasty ones here… We'll tackle each step in the upcoming section. Now lets look at the file step-by-step. We leave this part commented out as we wont be using cuDNN in our installation. It speeds up the Caffe processes but for a general (simplistic and working) installation, it can be left out. We build caffe without GPU support (following the idea of having a simplistic,working installation). Pretty self-explanatory with the comments. This is the path to your local installation of CUDA. You can chose from ATLAS, MKL, or OpenBLAS for your BLAS choices. Use this only if you need MatCaffe interface for Caffe. Following our idea of simplistic installation, we will skip this part. Now this is a tricky part. To install Caffe with the python interface, PyCaffe (Recommended) you need to give the paths to your python include libs and the path where you have numpy stored. Path to numpy include folder must be given with great caution. You might land into unnecessary trouble by specifying this path incorrectly. This was the most important tweak required to get PyCaffe up and running. You might have different versions of python installed on your local machine and in your homebrew instance. This would lead to problems when importing caffe from your python interpreter. To overcome this problem, make sure that you provide the correct path to your brewed python. The rest of the parts can be left out as they are not used anyways (commented out) and hold not much importance. You are all set to compile Caffe! Almost there! These commands will take a few minutes to execute. I'd suggest you skim through the output of these commands being printed on the stdout and make sure you see no alarming warnings/errors. You might see quite a few warnings of unused variables and parallel threads (-pthread). These are not things you should worry about. Now to install and configure the python interface to Caffe, first lets make sure we have all the python dependencies installed. The requirements.txt file handles this list. IMP : Don't forget to set the PYTHONPATH variable in your ~/.bash_profile (OSX) or ~/.bashrc (Linux) to the caffe python. Some versions of the official documentation show that the PYTHONPATH variable needs to be set to <caffe-home>/python/caffe, however this is an error in the documentation and the above path should be set. You might also run the following command to create a distribute directory with all the Caffe headers, compiled libraries, binaries, etc. needed for distribution to other machines. Now you are all set to rock! Play around with a few examples like Training LeNet on MNIST or see how to use the pre-trained models like ImageNet. Hope this page helps reduce some effort required to install Caffe on your machines. To view our bigger attempts at reducing this overload, checkout the CloudCV organisation page. The BVLC Caffe issues and the caffe-users google-group are excellent sources to get your queries solved and debug the errors you face. I have taken references from a lot of sources I found online and one can easily find them through the sources cited in above bullet. This wiki is for educational purposes only.